East Coast aviation buffs should mark their calendars for Saturday, Dec. 17, when the 108th Celebration of Powered Flight will be held at the Wright Brothers National Monument in Kill Devil Hills, N.C. Well, it’s probably not exactly the 108th celebration … no one likely paid any attention to such things for a few decades. But this event does promise to be special. It starts at 8:30 a.m. and, weather permitting, there’ll be a military aircraft flyover at exactly 10:35 a.m. — precisely when the Orville Wright “powered” off a 60-foot monorail guide and flew the brothers’ biplane a total of 120 feet. 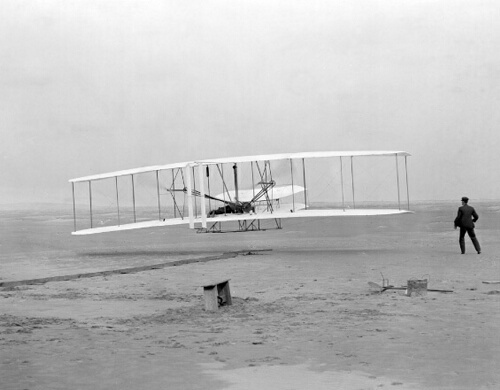 Orville Wright's famous first airplane flight at Kitty Hawk, N.C., on Dec. 17, 1903. The site is now the city of Kill Devil Hills, south of present-day Kitty Hawk. That's Wilbur Wright on the right. No details yet on which aircraft will be involved. But given that the event’s also billed as marking the 100th anniversary of naval aviation — and given that Vice Adm. Bill Gortney, director of the Joint Staff at the Pentagon and a veteran Navy jet pilot, will be giving the keynote address — here’s guessing there’ll be a Navy jet or two involved. DEC. 15 UPDATE: The military flyover will be all Navy: F/A-18 Hornets from Carrier Air Wing 7, according to the First Flight Society. 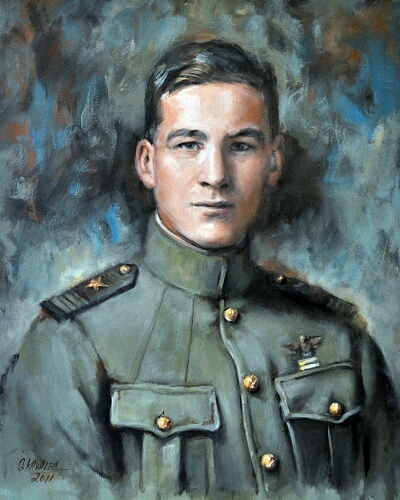 In addition, the first Navy ace, Lt. David Ingalls, will be inducted into the First Flight Shrine. Lt. David Ingalls, the Navy's first ace. You can read about his World War I exploits here. A separate flyover by civilian aircraft will take place later in the day. And descendants of those who witnessed the first flight will lay wreaths at the marker where the flight occurred. Wright Brothers National Memorial Park entry fees are waived for the morning of December 17th, so attending the ceremony will be free of charge. For more information about his year’s event, visit the event page on Facebook at www.facebook.com/FirstFlightCelebration. It’ll be good day — weather permitting, of course.